Customer Proposals and the Pricing Tool. The pricing tool helps you figure out the price to charge for your work based on a variety of options, including markup for each item, labor rates, taxes, and overhead. The results can be customized based on your preferences. The proposals tool lets you print a professionally-formatted pricing proposal that you can give to your customers. In this video, we show how to work with the Pricing screen, including the many ways to customize the pricing calculations. We also show how to specify markups for your raw materials. Then, we look at the customer proposal options in detail. The pricing and customer proposal features are available in the Gold and Platinum Editions. If you would like to follow along with the video, here is a copy of the project file used to create the pricing and proposal tutorial. 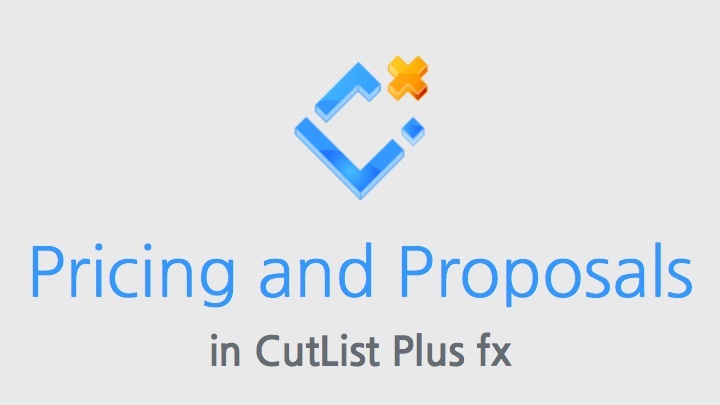 In addition to calculating the cost of your project, CutList Plus can help you figure out how much to charge your customers. You have a great deal of control over pricing options, to suit they way you do business. Here, you can see some of the many settings you have control over.